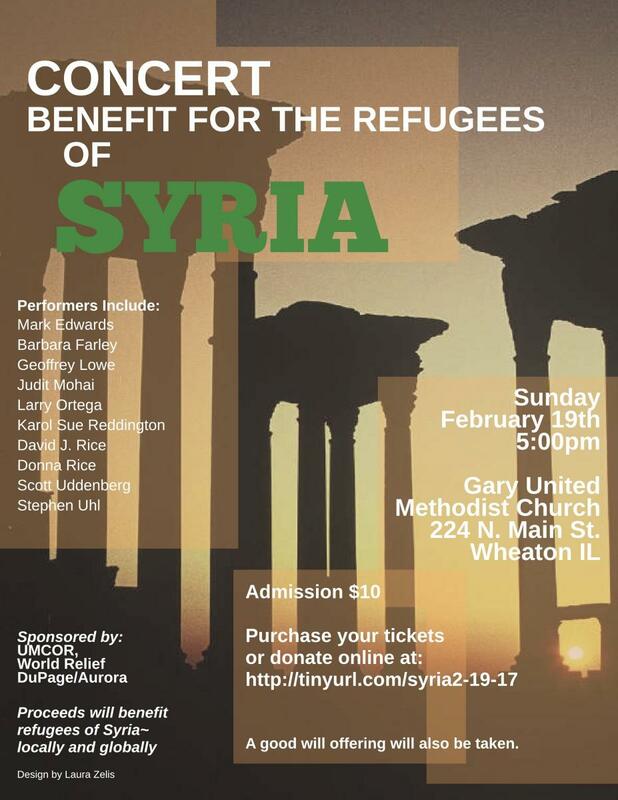 Sunday, February 19 at 5:00 p.m.
St. Andrew UMC Immigration Ministries is working with partners Gary UMC, World Relief, and other Syrian groups to hold a fundraising concert for Syrian Refugees on Sunday, February 15. Admission is $10. All proceeds above costs will go towards the United Methodist Committee on Relief (UMCOR) and World Relief. Funds for UMCOR will go towards international relief efforts and funds for World Relief will go towards resettling Syrian Refugees in this area. Noted area musicians will present works ranging from brilliant and well-loved classical instrumental and vocal works to exciting jazz movements.